The Audi A5 family gained a new member in April this year – the Audi RS5. The most powerful and the most expensive comrade of the ‘Brat Pack’, as Audi likes to call it, was among the cars present at the 7th edition of the Audi Sportscar Experience. 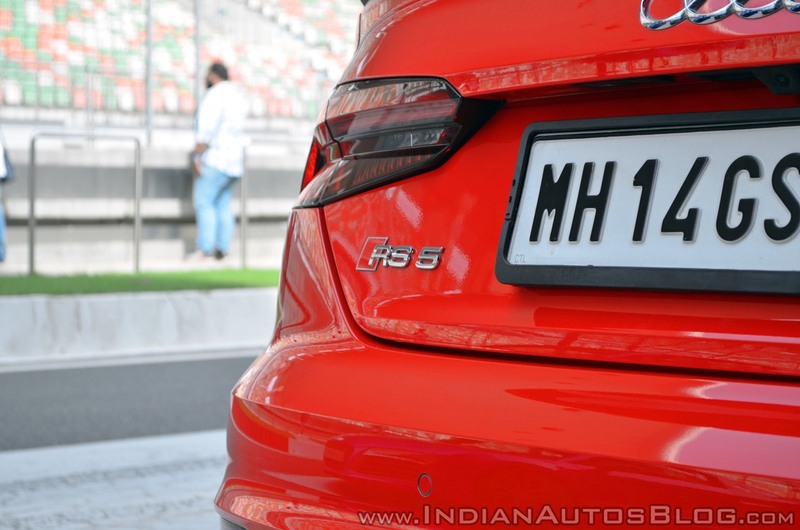 So I jumped into the driver’s seat of one for a few laps of the Buddh International Circuit to find out if a 450 PS 2.9 L V6 with AWD in a gorgeous 2-door coupe is as delicious as it sounds. The RS treatment Audi has meted out leaves you in no doubt that the car in front of you is no ordinary coupe. A sizeable Singleframe grille with a honeycomb mesh, lateral air inlets next to the matrix LED headlamps, wider wheel arches, and a rear diffuser with oval tailpipes are some of the defining features of the Audi RS5. Since Audi offers the A5 coupe only in the RS’d variant, you wouldn’t have to worry about people mistaking it for docile versions of the A5. I’ve said it before when I reviewed the Audi A5 Cabriolet and Audi S5, and I’ll repeat it – the A5 lineup comprises quite easily the best looking Audis on sale right now. The low set nose, wide stance, and the RS5’s coupe body style are guaranteed to turn heads out on public roads. 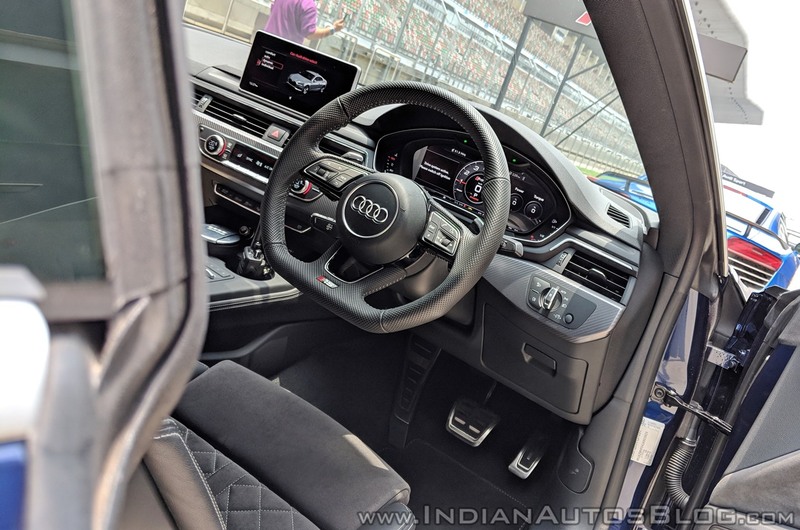 The cabin of the Audi RS5 is equipped with all the bells and whistles one would expect from a car priced north of a crore. The dashboard layout is identical to the rest of the A5 range save for variations in the dashboard trim and seats. There’s a flat bottom steering present with RS badging and seats draped in either Alcantara/leather or Nappa Leather based on the customer’s preferences. The Audi virtual cockpit includes an RS display specific to this particular variant. It comes with Audi’s MMI infotainment setup, a 755 watt 19-speaker Bang & Olufsen audio system, massage seats, and 3-zone climate control. The rear bench can just about seat two, but you do get a rather generous 465 L boot, although that is hardly any relevance to someone wanting an Audi RS5. On to the business end of things, then. For the 2018 RS5, Audi has chosen a 2.9 L V6 replacing the older model’s 4.2 L V8. Now, before you scoff at the relatively ‘puny’ engine and dismiss the RS5 as another victim of downsizing, do note that this V6, thanks to twin turbochargers, makes the same amount of power and more torque than its predecessor. Available at your disposal are 450 horses coming in at 5,700-6,700 rpm and a peak torque of 600 Nm spread across 1,900 to 5,000 rpm. A ZF-sourced 8-speed torque converter, in conjunction with Audi’s Quattro AWD system, sends power to all four wheels. All that power and torque helps haul the 1,770 kg Audi RS5 to 100 km/h in 3.9 seconds. The top-speed is limited to 250 km/h. 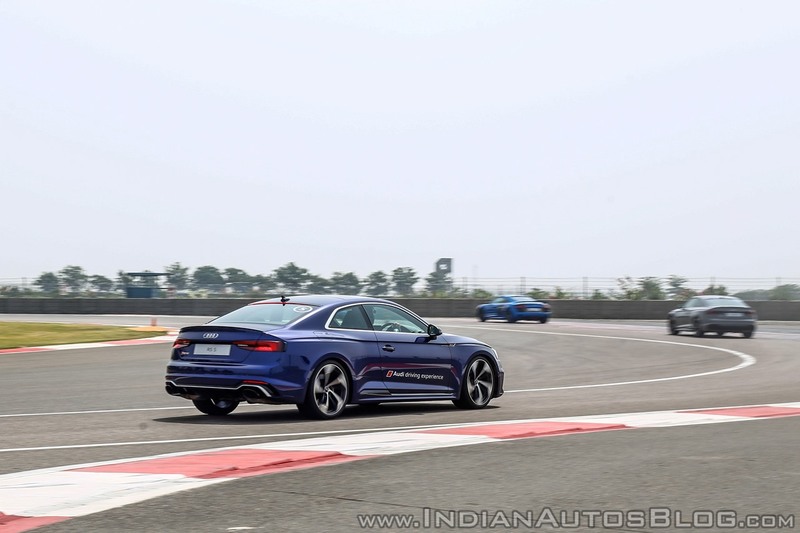 The Audi RS5 is an excellent track day tool. Power comes in thick and fast helping you accelerate out of corners with addictive urgency. The Quattro AWD setup coupled with all the onboard nannies can make even the most inexperienced drivers look like heroes out on the track. I have limited track experience, but despite that, the car gave me enough confidence to push harder as I went through the laps trying to keep up with an Audi RS LMX piloted by pro-racer Aditya Patel. For the track, I kept the Audi Drive Select in Dynamic mode, for obvious reasons. The Audi RS5 is at its sharpest in this mode suitable for when you’re out apex hunting. There are two other preset modes to choose from – Auto and Comfort. The fourth setting – Individual – allows for, as the name suggests, a setup based on personal preferences. The steering has sufficient weight and is very responsive to inputs. However, there isn’t much concerning feedback. I am yet to drive the Audi RS5 on public roads so; I will refrain from commenting on its on-road behaviour. However, the sighting lap and the final cool-down lap did give a glimpse of its ability to behave like a regular car when driven sedately. It gave me a sense that the Audi RS5 will be as comfortable in the restrictive confines of a city as it is on a racetrack. By all means, yes. 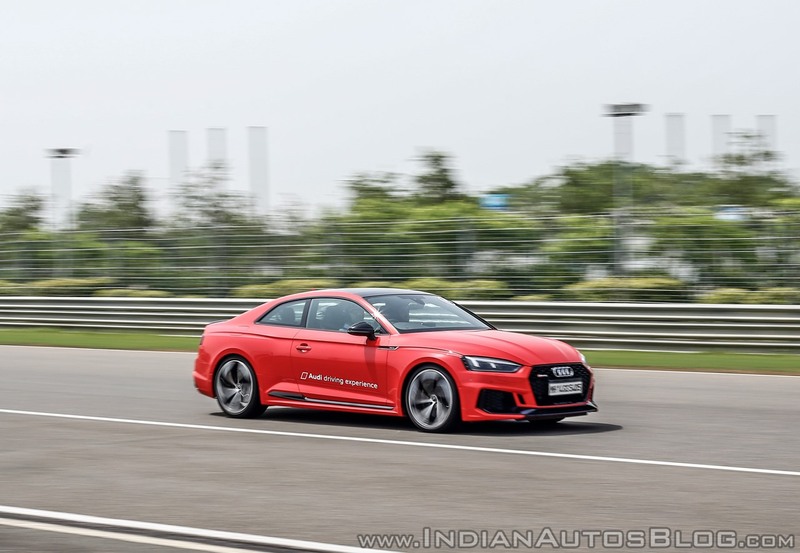 If you have more than a crore and would like to spend it on something that looks great, is fast without compromising on everyday usability, and comes with a mean sounding engine note, then the Audi RS5 is something you should be looking at. Audi offers the RS5 at an ex-showroom price of INR 1.1 crores, making it cheaper than the BMW M4 and the Mercedes-AMG C63. There is some optional equipment to choose from including the stunning 20-inch rims seen here on our test cars. 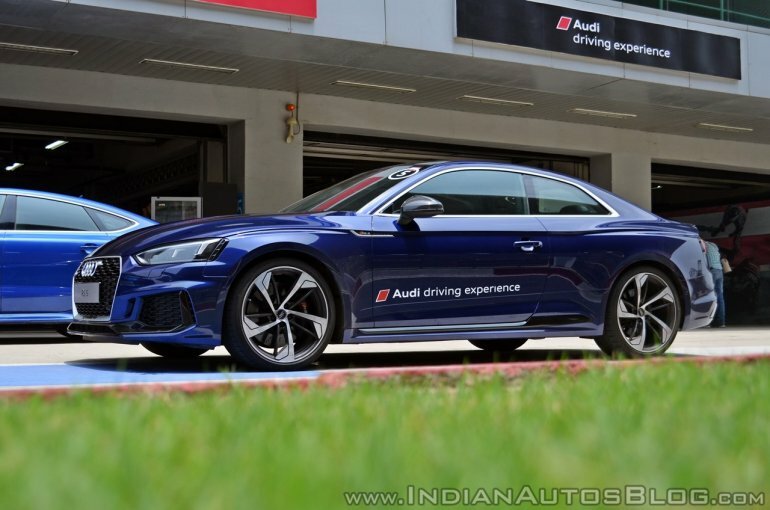 My time behind the wheel of the Audi RS5 was part of the Audi Sportscar Experience. 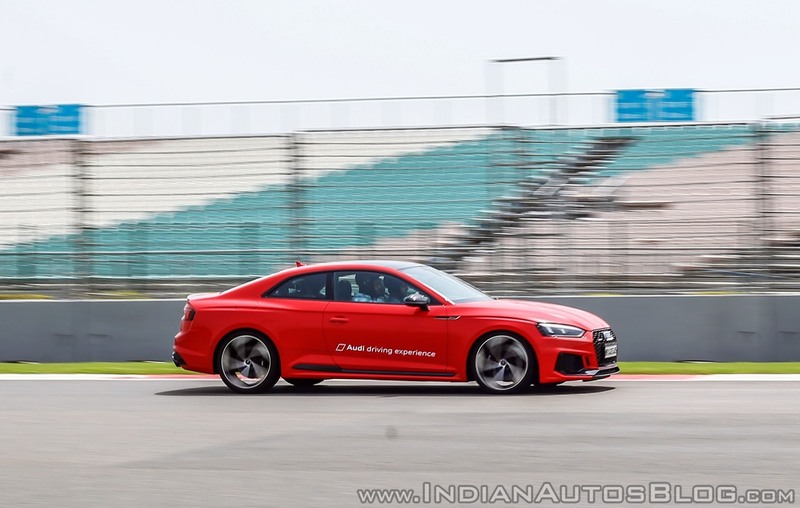 The annual event lets customers and enthusiasts sample the best of Audi’s lineup in India including the likes of the S5, RS6, RS7, RS5, and the Audi R8. Customers get a chance to intimately experience the full range of capabilities of Audi’s performance lineup under the guidance of professionals. Through its seven-year existence, over 2000 customers have participated in the Audi Sportscar Experience. 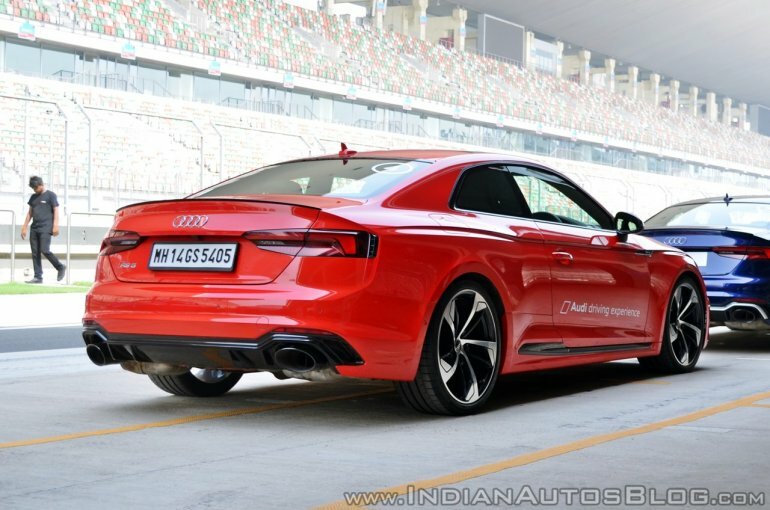 The Audi A5 range comprises the Audi A5 Sportback (INR 55,40,000), Audi A5 Cabriolet (INR 69,24,000), and the Audi S5 Sportback (INR 72,41,000).